Today is the first full day of Rosh Hashanah, so instead of getting up early this morning and heading to work, I was up early and went to synagogue. I’ve been going to my shul for more than 8 years, and while I’m no longer much more than a High Holy Day attendee, it feels like home. I’m always greeted by people I haven’t seen in a while, receive warm holiday wishes from the Rabbi, and occasionally (like today) am asked to participate in services. The Jewish New Year is a more solemn holiday, but it it’s always mixed with happiness for me. I use the High Holy Days as a time of reflection to really examine my relationships, my career, my personal life, and my goals. I try to think about both the positive and negative aspects of each, as well as about how I can improve them and be a better person over the upcoming year. It’s a cathartic holiday, one that often leaves me emotionally drained and with lofty goals, but always leaves me with a feeling of optimism. This year is no different, and after a long day of service, I came home and went for a run to help work through some of my thoughts. After that, Hubby and I ordered pizza for dinner, since the meat he took out wasn’t fully defrosted, and I opened a Kosher Cabernet Sauvignon. 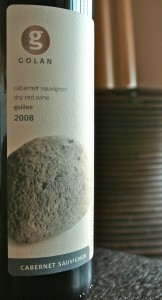 The 2008 Golan Heights Winery Cabernet Sauvignon (winery, snooth) was made with 100% Cabernet Sauvignon grapes and had a deep, purplish ruby color. On the nose, there were blackberries, dark plums, black cherries, blackcurrant, smoke, cedar, vanilla, and a hint of spice and dark chocolate. In the mouth, there were blackberries, black cherries, blackcurrant, vanilla, cedar, and a hint of dark chocolate and minerality. The wine had big, smooth tannins, medium acidity, and a medium-to-full body. Is this worth a glass after work? It’s worth more than one! What are you waiting for? At $16, this bottle is worth every penny, as it’s absolutely gorgeous. It definitely needs a time to breathe, but as long as you have some patience, it’s worth the wait. The wine can easily transition from a food-friendly, dinner wine to an on-its-own, relaxing-after-eating wine. It’s still young, so it’s fruit-dominated, but the wine has the potential to develop a nice complexity over the next few years. So, take everything you think you know about Kosher wine and forget it because the 2008 Golan Heights Cab is a wine worth drinking whether you’re looking for a kosher wine or not. I so want to try this Cab! Thanks for sharing.